Allah’s Quran does not have a worldly punishment for blasphemy. It teaches forgiveness. 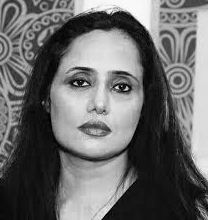 In a landmark verdict on October 30, 2018, a three-judge bench of the Supreme Court of Pakistan dismissed the case against Asia Noreen, a Christian woman who had been sentenced to death in 2010 on an allegation of blasphemy. The Supreme Court on the basis of the legalities of the case overturned the sentence, and ordered Asia bibi’s immediate release. Allah’s Quran does not have a worldly punishment for blasphemy. The dismissal of her sentence is not the result of an appeal of mercy presented by a convicted accused. 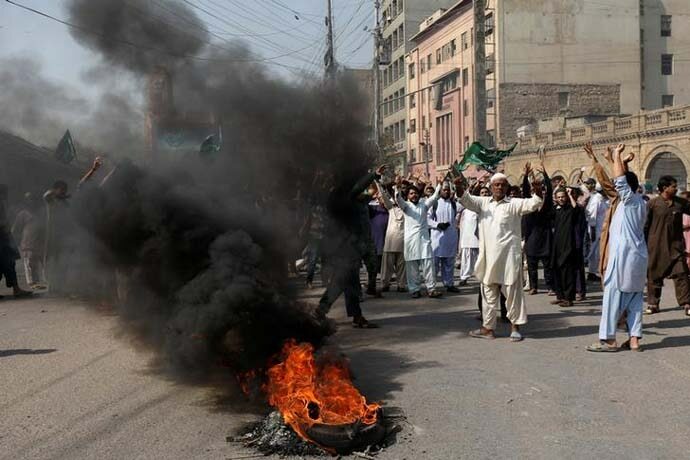 The appeal was for a review of the case, and the bench that included the Chief Justice of Pakistan Saqib Nisar decided after a thorough study of the case in its entirety that Asia bibi was not guilty of blasphemy. The court decided on the basis of the following factors: insufficient evidence, late filing of an FIR, contradictory statements of witnesses, complainant’s confusion about the date of the alleged crime, huge discrepancies vis-à-vis FIR and arrest, fabrications of the primary complainants, and the extrajudicial confession of Asia bibi. The reaction in an almost 97 per cent Muslim Pakistan should have been that of joy. That a Christian woman accused of blasphemy of Prophet Mohammad (pbuh) had been found after a thorough review by the highest court of the land to be not guilty. The indoctrination and conditioning of the countless is absolute. Islam is taught to them distorting everything it stands for. What happened was what was expected. 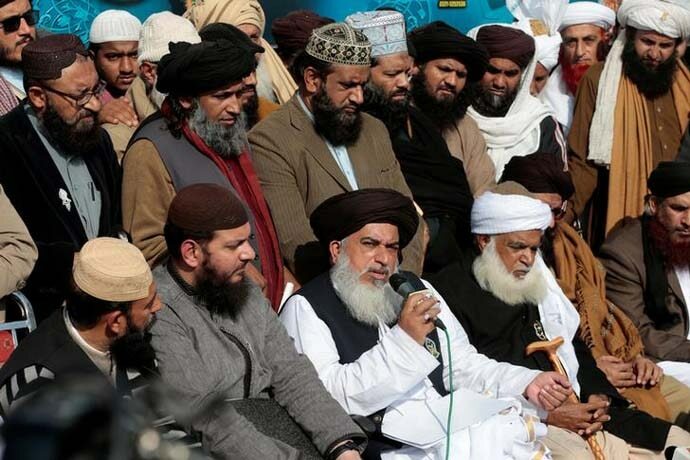 Led by a new, self-appointed guardian of religion, Khadim Hussain Rizvi, “Ameer” of the self-avowed vigilante group of the finality of prophethood, Tehreek-e-Labbaik Pakistan (TLP), hordes of bearded men took to roads wielding hockey sticks, batons, chanting Allah and Mohammad (pbuh), and spouting cuss words, some bleepable ones written on misspelled posters and banners. The cry was against the Supreme Court for freeing a guilty woman, the government of Prime Minister Imran Khan for supporting that decision, and the armed forces for doing what they are supposed to do: not interfere in civilian matters. After blocking roads and highways, torching motorcycles, rickshaws and pick-up vans of poor people, destruction of properties, harassment of peaceful citizens, chanting slogans of incitement of violence towards the judges and calls of sedition in army, the protest came to an end on Friday night after the government — in what is said to be a meek capitulation to demands of extremist elements, and a supercilious apology from the TLP — signed an agreement with the TLP. More disturbances are expected if the demands are not met. At the moment, Islam in the Muslim majority Pakistan is safe. 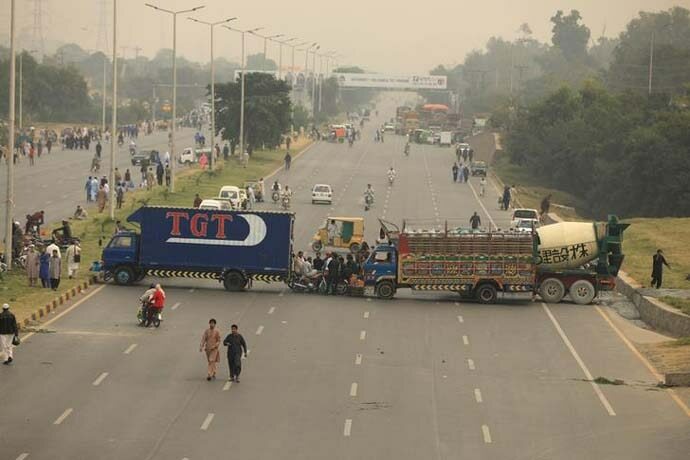 And this too shall pass.Using Allah and His Prophet'sﷺ name to unleash chaos in Pakistan is not going to work, Khadim Rizvi and goons.Pakistan must remain united when terrorists like Rizvi use young men from poor families to do his dirty work of harm and destruction. As the self-appointed vigilantes of Islam act like gangsters on crack, I can’t help but think about what the Holy Quran says. The one guidebook for all Muslims, since the beginning of Islam until the end of the world, has very clear instructions regarding words that are undesirable, acts that are prohibited, and the appropriate penalty or punishment. Surah 7 Ayat 180: And Allah’s are the best names, so call on Him thereby, and leave alone those who violate the sanctity of His names. They will be recompensed for what they do. It is said quite clearly that those who desecrate Allah’s names must be left alone, that the faithful must separate themselves from those who violate the pureness of His name. And it is only Allah who will decide what the penalty for that act of disrespect is. Surah 46 Ayat 8: Nay, they say: He has forged it. Say: If I have forged it, you control naught for me from Allah. He knows best what you utter concerning it. He is enough as a witness between you and me. And He is the Forgiving, the Merciful. When the disbelievers used to say to Prophet Mohammad (pbuh) that he had forged the Quran, the response he was to offer was through this divine revelation. That only Allah has the power to decide the punishment for even an unthinkable sin such as forging the Quran. Only He is the witness to all things. Surah 4 Ayat 48-50: Surely Allah forgives not that a partner should be set up with Him, and forgives all besides that to whom He pleases. And whoever sets up a partner with Allah, he devises indeed a great sin. Hast thou not seen those who attribute purity to themselves? Nay, Allah purifies whom He pleases, and they will not be wronged a whit. See how they forge lies against Allah! And sufficient is this as a manifest sin. One act that Allah finds undesirable is display of piety in the form of showing rage against people. Deciding on matters that are only Allah’s propagative is the real meaning of the word shirk (association). It denotes not believing that He is there, taking matters in one’s own hands, making a god out of self, not be afraid to stand in His place, and to follow one’s low desires. These are acts that are most hated by Allah. Surah 39 Ayat 41: Indeed, We sent down to you the Book for the people in truth. So whoever is guided — it is for [the benefit of] his soul; and whoever goes astray only goes astray to its detriment. And you are not a manager over them. No one is made a custodian over another, not even the prophet. Let Allah judge what we do; He is sufficient to take account, and those who try to do so using His name and judge others’ faith put themselves in His high place demonstrating He is not present or is insufficient over His Kingdom. That is a crime of high treason: when people consider they are in partnership with Him in His creation. Does there exist even one ayat or is there a religious scholar who could say with certainty that even one ayat can be interpreted as: Slay the one who violates the sanctity of the name of Allah or His Prophet? If we are to follow the ways of Prophet Mohammad (pbuh), what we know is that he was the kindest, most forbearing, most fair; that he became worried for the health of the woman when one day she didn’t show up to humiliate him; that he was a man who greatly worried that they be guided and that they believe, people who made an evil plan by night against him. Is the real reason that some people show wrath, go on a rampage and kill people in Allah’s name is to show that they are His true believers/lovers? They need to know that there is no way that the test of a believer will be measured with such a yardstick. And if they think they love Him, they must forgive and restrain their anger, just as we desire to be forgiven by Him and be shown mercy by Him. That is the mark of a real believer. For those who think that the mark of the believer is zebibah (“a mark on the forehead of some Muslims, due to the friction caused by repeated contact of the forehead with the prayer mat during daily prayers”), that it would be a testimonial to how much he prayed, how much he recited the Quran, and the number of umras he performed, they are myopically mistaken. The true believer would be recognised on the merit of how he lived his life as a whole, which includes all that, and doing good. How he tried his hardest to stay on the straight path (jihad), and how he managed himself with regard to others when times were trying (kitaal = fought). Allah’s Quran does not have a worldly punishment for blasphemy. Allah’s Quran teaches forgiveness. Allah’s two most recited names are Rehman (Beneficent) and Rahim (Merciful). And Allah’s Quran of 114 surahs has 113 surahs that begin with: In the Name of Allah, the Most Beneficent, the Most Merciful. That is the Islam that Prophet Mohammad (pbuh) knew, practised and preached. Which Islam do those people follow whose sole claim to religion is perpetuation of their agendas of hegemony, exploitation of masses, establishment of societal divisions, waging of wars and killing in the name of Mohammad (pbuh)? That to me is blasphemy for which there is no forgiveness. Here, and in the Hereafter.